Sent to Christchurch City Council 16 sec later. 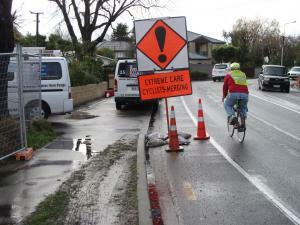 Men At Work have blocked the northbound cycle lane on Centaurus Rd just before Kowhai Tce with a roadworks sign (ironically it is an “Extreme Care Cyclists Merging” sign). Why they didn’t place it on the grass berm immediately next to where it is currently blocking the cycle lane is a mystery – it still would have been visible to all approaching road users without endangering cyclists.